This photo — most likely circa 1880s to 1900, according to the BHA archivist and collections manager — shows what looks to be a wide slide path in the same area as the recent Peak One avalanche. A juvenile skier was killed at Breckenridge Ski Resort March 21, after colliding with a tree on Peak 10. The skier’s identity is being withheld until the next of kin have been notified, and their age was not disclosed. The death marked the seventh skiing fatality in the county this season, and the second in a little over a week after 62-year-old David Gissel passed away due to acute heart failure at Copper Mountain on March 13. The town of Frisco announced last week it will be cancelling its annual Fourth of July fireworks display over Dillon Reservoir. The town said the move comes in an attempt to mitigate wildfire risks, abut also to avoid headaches related to increased traffic after Breckenridge canceled its fireworks display two months ago. Emergency and town officials were concerned about potentially large-scale issues surrounding traffic, parking and crowds if they hosted the only fireworks show in the county. The town is still dedicated to providing plenty of programming to help residents get into a patriotic spirit this Fourth of July. Festivities will still include the Team Summit Pancake Breakfast at the Old Community Center, the Kids Fishing Derby at Meadow Creek Park, the Fabulous Fourth of July Parade, two free concerts and more. After a month-long investigation into a series of ski and snowboard thefts in the town, Breckenridge police made an arrest after a search warrant allowed officers to recover the stolen gear. Thomas Edward Yacko, 32, was taken into custody after an “informant” made contact with the man and purchased a pair of Atomic skis from him for $150. Officers with the Breckenridge Police Department later executed a search warrant on Yacko’s residence in Breckenridge on March 18, recovering 10 pairs of skis, 10 snowboards, 13 sets of goggles, six pairs of snowboard bindings, eight pairs of high-priced gloves, three helmets, a bag of uphill skins and several poles. The preliminary estimated value of the stolen property was between $5,000 and $10,000. Yacko was released on a $2,000 bond and is set to return for an appearance on bond in county court on April 24. A photo from the Breckenridge Heritage Alliance shows that the recent avalanche path near Peak One may not be as new as everyone thinks. 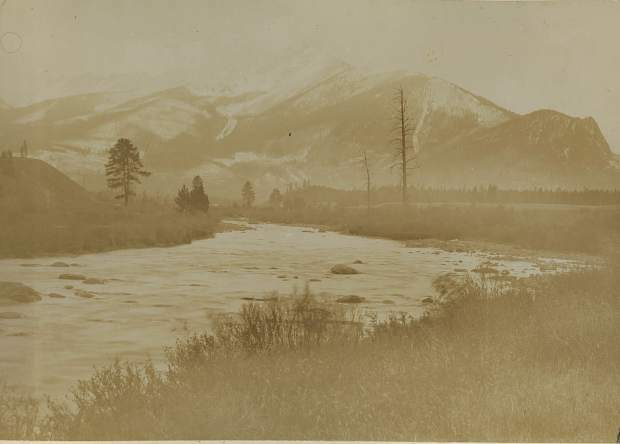 The photo — most likely circa 1880s to 1900, according to the BHA archivist and collections manager — shows what looks to be a wide slide path in the same area. The caption on the original photo reads “view showing traces of ancient snow slides,” meaning that slide potentially existed prior to the 1880s, though research is still ongoing to determine when it originated. The skier who passed away at Copper Mountain lMarch 13 was identified as 62-year-old David Gissel of Colorado Springs. The skier was found unconscious in the trees on the edge of a ski run at around 4:45 p.m. Gissel was taken to St. Anthony Copper Medical Clinic where he was later pronounced deceased. Summit County Coroner Regan Wood said that the manner of death was natural, and that Gissel passed away due to acute heart failure.